Ah “Ellisdons” ! The promise of the adverts nearly always led to disappointment and the result was a pile of discarded tat. I used to scan the fine print of their catalogue for any hidden gems to buy. 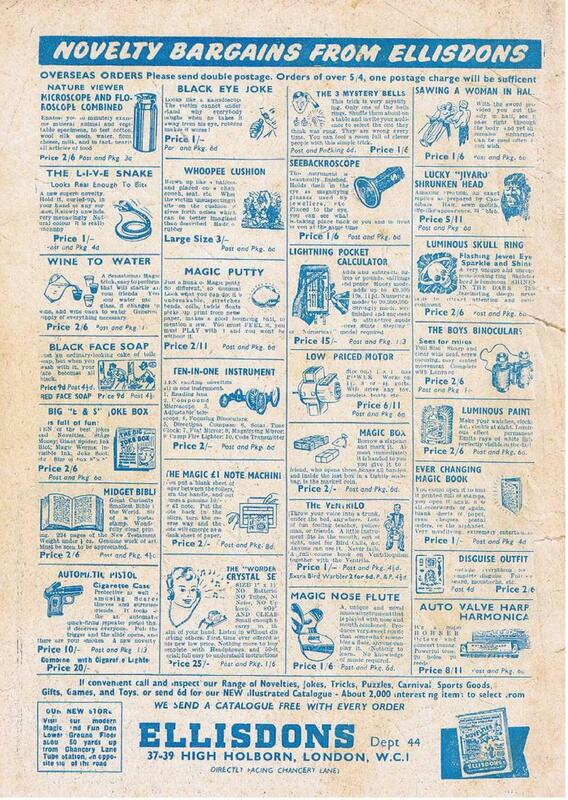 My favourite was “Magic Putty” which came in grey plastic cone and had a flesh like pink colour. This gradually darkened after many happy hours pulling the print off comics and bouncing it on the ground ( a bit like a “Wammo Super Ball” but less hard ). I actually used to chew it like chewing gum too!I wonder if that’s how I got worms as a boy? It stretched for several feet if you pulled it apart slowly and snapped if pulled apart sharply etc etc. I loved my “Magic Putty” almost as much as my “Magic Robot” and life was simple. Can you still get “Wammo super balls” ?? What dangerous weapons they were. Slamming them against the pavement and actually bouncing them over the house and onto the back lawn/unsuspecting family….there were also mini super balls ideal for wreaking havoc in classrooms…. “Wammo Super Balls” did bounce in a lethal way, as you say. They were rock hard too.The only colour that I saw them in was an ominous black and the shiny outer surface material chipped off eventually making the bounce even more erratic. I remember a school mate losing a couple of front teeth when his Super Ball bounced right up into his lower jaw and knocked his jaws together with a dull clunk. The Health and Safety Executive probably wouldn’t authorise such a demented rubber ball like “Wammo” these days! Boy did they bounce. The mini balls didn’t satisfy in the way the full size balls did. I am sure that “Red Comet” could have used a few “Wammo Super Balls” to fell that Dino monster depicted on the front of his rather rouge comic cover too. “Red Comet with Balls” gets my vote!